Curious if anyone has a thought on this photo. 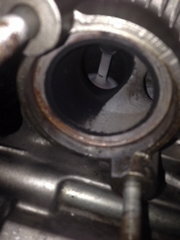 Rear Cylinder with one exhaust valve cavity Black other side White. Checked valve adjustment last summer, within spec. Compression 155 PSI cold at about 250 RPM. Plug looked good. Bike runs good, just thought this was odd. Thanks in advance. If it were my bike I would pull the valve cover and have a good look at the valve train. The reason for this is that it does look like only one valve is opening. I've only torn into a couple of SHs and I've seen similar residue patterns in two that still had the PAIRS (air injection) one had an extremely clogged air filter (causing a rich condition) the other had a jet kit set up way to rich. Just a thought. One the pattern went away after de-PAIRing, the other I never saw again. So based on that I would also check you choke fittings. They break super easily and if they do they will richen the circuit causing richness like CaryDG describes. They are plastic and poorly made. You can fix them or replace them with brass Polaris unit.